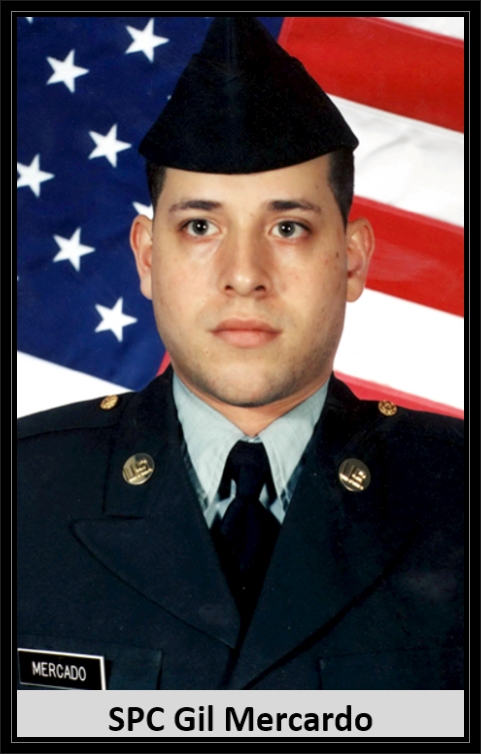 Hometown: Paterson, New Jersey, U.S.
Died: April 13, 2003 in Operation Iraqi Freedom. Unit: Army, 3rd Battalion, 187th Infantry Regiment, Fort Campbell, KY. In the Puerto Rican supermarket mural that Army Spec. Gil Mercado painted as a teenager, the nameless hero was part man-part robot and defeated evil. Mercado, 25, of Paterson, N.J., died doing the same for his country, his family said Monday. He was killed Sunday by a non-combat weapon discharge in Iraq, the Pentagon said. He was assigned to the Army's 3rd Battalion, 187th Infantry Regiment, based at Ft. Campbell, Ky. The Pentagon said Monday that 118 American service members had died so far in the war with Iraq. Four were missing. Described as handsome and tall with green eyes, Mercado was also creative and playful, his family said. Despite urging from those around him, Mercado hesitated to publish his comic books or drawings, said his brother-in-law William Rosa. "For him it was not a matter of getting any type of recognition. It was just something to satisfy himself, to speak for him more than anything else," Rosa said. Mercado's sister, Rosa, remembered her brother as a comedian. She recalled him as a 7-year-old, putting on a wolf mask, squatting like a dog and howling at the moon one Halloween, scaring people. Gil Mercado also liked boxing and martial arts, his sister said. "He would take off the camiseta [Spanish for shirt] he was wearing to give it to you," William Rosa said. Mercado was born in Hoboken, N.J., in 1977. As a teenager, he lived in Puerto Rico, where he grew up skateboarding and fishing, his family said. He then moved to Paterson, met his wife, and about 6 years ago told his family that he was going into the Army. His decision met with disapproval, and his family reminded him of his many other options. Mercado must have thought he needed to do something more meaningful with the rest of his life, his brother-in-law said. Rosa Mercado spoke with her brother in March before he was sent to Iraq. He said goodbye to relatives in case he didn't make it home. "He wanted to make sure we knew how he felt about us," said his sister. "... I'm just so proud of him being where he wanted to be, doing what he wanted to do."